Whether you like the idea of a front-wheel drive 1 Series or not, it’s happening. Not only is it happening but it’s going to be very important for BMW. The 1er is a big seller where it’s available (which it’s unfortunately not in America) and a fan favorite among BMW enthusiasts. So if it can still deliver on what fans love once it goes front-wheel drive, while increasing interior space and being better value, it should continue to be a massive hit. The one that really matters, though, is the BMW M135i xDrive and it’s just been revealed a bit in some new photos. 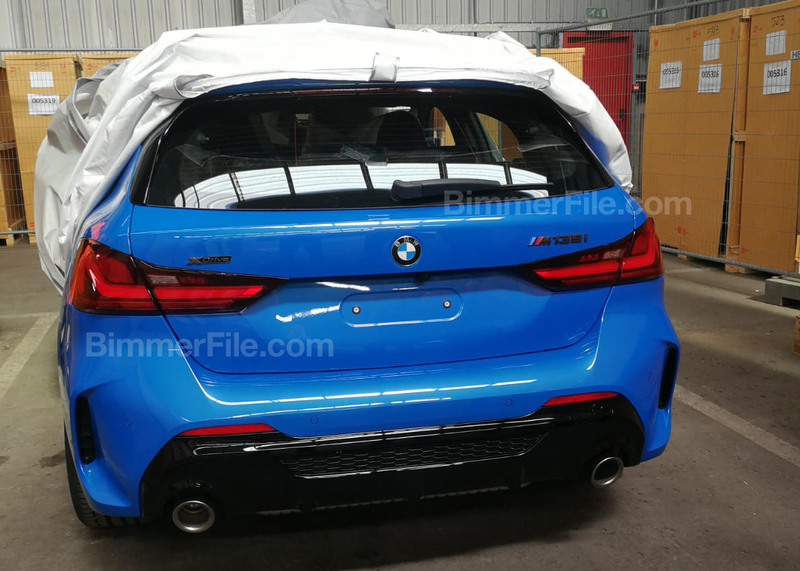 In these new photos, we can clearly see the front and rear ends of the upcoming BMW M135i xDrive, completely sans camouflage. But let’s start with the front, where it gets a familiar M Performance design cue — its Kidney Grilles. Like a lot of new BMWs, its grilles are connected at the middle, which firstly is a design cue some enthusiasts aren’t too fond of. Nevertheless, it seems to be the direction BMW is headed in terms of its grilles. The second interesting point about the new 1er’s grilles is that they feature a new pattern inside of them, rather than BMW’s traditional vertical slats. It’s a new design seen on the M340i and Z4 M40i as well. So it seems to be the grille that M Performance cars are going to have. Beneath the new grille are some air intakes, which are large and sporty looking, helping to signify that this is in fact an M Performance car. It also gets what seem to be vertical air intakes for brake cooling but we’re not entirely sure if they’re functional or not. Beneath even that, there seems to be a little front lip, which is finished in gloss black. Out back, we get the first look at the new 1 Series’ taillights and they’re much more angular than what we’ve seen on other new Bimmers. They look good, though, and make the back end sportier looking that its predecessor’s. It also gets more vertical air vents that flank either end of the rear bumper, which seem to be common on new BMWs lately. They don’t seem functional, though. Then there’s the classic BMW dual exhausts at the bottom. Overall, though, this new BMW M135i xDrive looks good so far. It looks sharp and sporty and aggressive. Despite its front-drive basis, this new BMW M135i xDrive looks and sounds like it might be more of a hot hatch than the outgoing BMW M140i. It won’t be faster — in fact, it will almost certainly be slower — but it might have more of an attitude about it and that’s really what hot hatches are about, not outright speed.